On Google’s related entities patent: Write awesome posts! Perhaps you’ve read about the related entities patent which was recently granted to Google, or perhaps you haven’t yet. You should read Dave Davies post about it on Search Engine Land and find out more about it. The related entities patent gives us valuable insights into how Google identifies relationships between content. So, in this post, I’ll try to explain a bit about the patent without making it all to complicated. And, I’ll discuss the importance of the patent for your content SEO strategy. What is a patent? Why is it important? Google applies for a lot of patents. When the patent is granted, it gives us information on how they engineer their search engine. If you’re interested in that kind of thing, you should check out Bill Slawski’s site SEO by the Sea. This specific patent about related entities implies that related entities, related content, and relations in general are becoming more important. It’s important to remember that we do not know exactly how Google has applied this specific patent in its search engine. We can only guess, test and speculate how Google will use it. The way the search engine works and how it serves the results to our search queries give us a lot of information though. Think of it as an educated guess. So what does this mean? What does Google do with it? In his post on Search Engine Land, Dave Davies explains beautifully how these related entities work. Google has an actual entity database in which it saves which concepts and which identities belong together. This database is ever growing, and Google learns more and more about how things are related to one another. This means that if certain concepts turn up together in content in various places on the internet, Google will save these in its entity database. This process is ongoing, which means that for some searches, you won’t get the same rich result as for others. Try searching for [types of cheese] and [types of shoes] to see the difference. While Dave Davies was mainly talking about entities as big things – presidents, people, actors; I think that words, things and concepts could also be entities. Thinking of words and concepts as identities, which are also saved in that entity database, will have some consequences for copywriters and content SEOs. Of course, this is speculation. Nobody knows exactly which concepts are in fact treated as entities by Google. Let’s look at an example to figure out what it means if words and concepts are considered entities. Google will probably notice that in content about [tagliatelle], the words [pasta] and [spaghetti] will also appear rather often. These words will probably be linked together in Googles entity database. 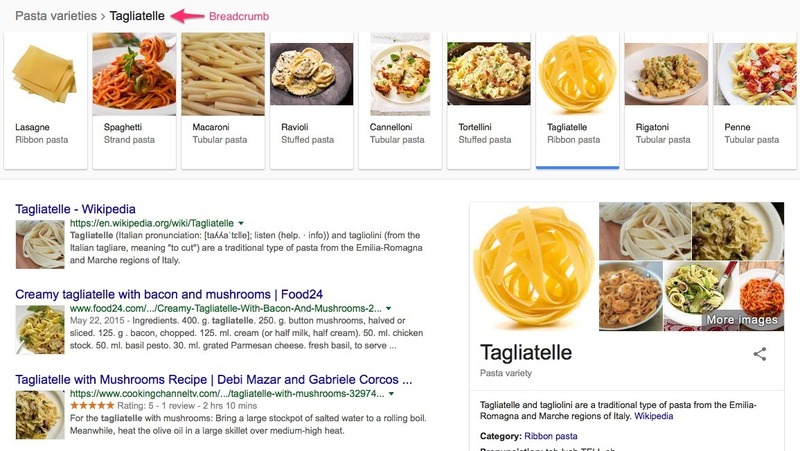 If someone is searching for [tagliatelle] in Google, content without the words [tagliatelle] but with the words [pasta] and [spaghetti] could also pop up in the search results. This would mean that the exact word matching would become less important. It’s all about context. And, we have seen this in the past few years. Google has become more and more adept at matching a search query to content without the exact search phrase in the text. What does it mean for content SEO? I think that the exact matching of a search query will become less important. Concepts, words and things related to a specific topic will become more important. By using the words, concepts and phrases related to tagliatelle in your post, you’re increasing your chances to rank for the term ‘tagliatelle’. That does not mean, however, that you should not focus on keywords anymore. Google is getting better at establishing what the audience is searching for. But you should know what your audience is searching for when you are writing. You should know which words, concepts and phrases they are using. And you should use those same words as well. You want your audience to recognize your text as an answer to their search query. You should keep on using the keywords and keyphrases that your keyword research provided. Don’t go overboard though, and use your keyword carefully. I think the most important thing to realize is that a keyword is not a topic yet. It cannot be seen as an entity as it does not have the correct context. You’ll need an angle, a specific story around a keyword, a good idea to write a blog post. An idea in which the desired focus keyword could have a prominent place. You should think about your audience. What do you want to tell your audience? What’ll be the main message of your article? And what is the purpose? If you write an original article, an article people would want to read; you’re probably already using all of the terms that are related to your keywords. It’s rather hard to write a blog post about tagliatelle without using the word [pasta]. You’ll use the related entities, simply because they are related. It’ll probably just come natural, as long as your trying to write an original text. Although I think that if you’re writing a good text with an original idea, you’ll probably already be using all the related concepts you should be using; you should also think of synonyms to your keyword. Take a moment and try to come up with a few alternatives for your keyword. Think of things that are strongly related to your keyword. Use these words in your text and you’ll probably increase your chances to rank. Besides, your content will be more pleasant to read as well! Keywords remain essential. However, the exact matching of a keyword will become less important. And synonyms and related concepts will become more important. We don’t have a bullet for synonyms or related words in our SEO analysis yet. I guess that’s a hard one to establish. Could we do that? Does anyone have any suggestions? The post On Google’s related entities patent: Write awesome posts! appeared first on Yoast.